March 31, 2019 to be considered. Our scholarship fund raising efforts have provided nearly $40,000 since 2009-- most notably from member dues and our Annual Trail Drive event. From our members to our supporters who make this possible....THANK YOU!! ​Margaret McCoy...a PhD candidate in Horticulture at WSU. Her research focuses on vineyard management, identifying equipment and fungicide programs to control powdery mildew. Agriculture, soil, sprayer technologies and improving viticulture practices in Washington are her passions. ​Andrew "Tyler" Williams...is pursuing a Master's degree in Food Science at WSU where he is evaluating the impact of juice pH on microbial ecology and wine quality (specifically composition and sensorial changes) Spending his childhood summers clipping drip-tubes over new plantings, bottling wine and learning about farming at his families Kiona Vineyard on Red Mountain he has developed a passion for the industry. 2017 HHH Scholarships have been awarded to Lacey Desserault and Austin Morrell. ​Lacey will enroll at WSU this fall pursuing Agriculture and Food Science. She wants to use her degree in advocacy for agriculture and help farms and winemakers be more prepared and informed. ​Austin will be a junior at WSU this fall with a focus in Viticulture and Enology. His experience with hands on field work, bottling line, assisting in research and wine making will serve him will as he enters the industry. 2016 HHH Scholarship has been awarded to Caroline Merrell. Caroline is a PhD candidate in the Food Science Program at WSU. Working under Dr. Jim Harbertson, Caroline helped to successfully develop a method to quickly and inexpensively separate wine tannins and anthocyanins, to understand factors that stabilize wine color, contribute to wine mouth feel, and affect tannin size distribution with berry maturity and wine aging. 2015 HHH Scholarship was awarded to Carina Ocompo. Carina will be a junior this year in the Viticulture and Enology Department at WSU and will be interning with Dr. Naidu Rayapati at the Prosser research station regarding the work on grapevine viruses. She looks forward to pursuing a graduate degree in the subject. Congratulations Carina!!!!!!! On February 13, 2015, at the Washington Association of Wine Grape Growers awards luncheon Tri-Cities WA, the HHH Wine Growers were pleased to award their 7th annual scholarships. Braden Mortensen, assistant wine maker at Two Mountain Winery and enrolling in global wine studies at CWU. Lindsay Boutillier, interning at Owen Roe Winery and studies in vineyard technology YVC. ﻿The HHH Wine Growers proudly awarded it's 6th annual scholarships in Viticulture and Enology on February 7, 2014 at the Washington Association of Wine Grape Growers convention awards luncheon in The Tri -Cities. Jensena Newhouse and Braden Mortensen were awarded individual scholarships of $1500 for their continued education in the grape and wine industry. & Judy Champoux (Lady Hawk Vineyard). Recipient Braden Mortensen was unable to attend. 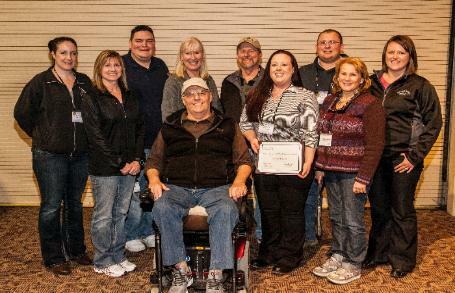 On February 8, 2013 the HHHWG awarded its 5th annual scholarships in viticulture and enology during the awards luncheon of the Washington Association of Wine Grape Growers convention held annually in The Tri-Cities. Braden Mortensen and Jensena Newhouse were each awarded $1500 to continue their studies in the Vineyard and Winery Technology Program at Yakima Valley Community College. Pictured from left to right: Monica Martinez (Martinez & Martinez Winery), Sandy Rowell (McKinley Springs Winery), Andrew Martinez (M &M), Mimi Nye (Ste Michelle Canoe Ridge Vineyard), Paul Champoux (Champoux Vineyards, LLC), Rob Andrews (Andrews Horse Heaven Ranch Vineyard), Jensena Newhouse (Recipient), Justin Andrews, Angela Andrews and Lindsey Andrews (Andrews Horse Heaven Ranch Vineyard). Recipient Braden Mortensen was not present.